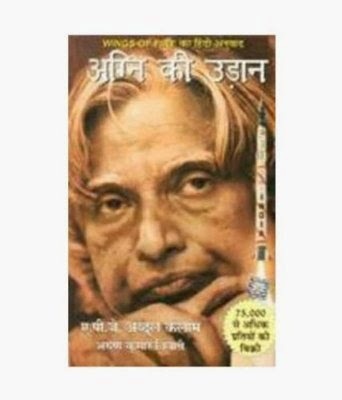 Agni Ki Udaan (Hindi) is a Hindi adaptation of Wings of Fire, an autobiography of Dr. A. P. J. Abdul Kalam, the 11th President of India, popularly called India’s ‘Missile Man’. Agni Ki Udaan (Hindi) narrates the story of Dr. Abdul Kalam, from his humble beginnings in Rameshwaram, to the esteemed status as the President of a country. Kalam reflects upon his life and trials, accomplishments, failures and jubilations that paved the way to his success. Giving a fresh perspective to the power of dreams, he speaks about how, as a young boy, he would look at the newspaper and promise himself, that one day his face would feature in it. Once he graduated from Madras Institute of Technology (Chennai) with a degree in Aerospace Engineering, Kalam embarked upon his career at Hindustan Aeronautics Limited and was in charge of building a hovercraft prototype. His background and to some extent, fate, led him to the nuclear research and missile programs such as Prithvi, Akash and Trishul. Special emphasis has been made on the successful launch of the Agni missile, an incident that set a milestone for India on an international scale. He also writes about his pivotal role in India’s Pokhran project, the nuclear tests in 1998. Kalam also lived in America for six months for a NASA training program. One of his most noteworthy contributions was helping establish the Vikram Sarabhai Space Centre and pioneering the very first space launch vehicle program in India. He was also conferred the Padma Bhushan in 1981. Apart from his personal life, Agni Ki Udaan (Hindi) also talks about India’s status on defence and self-reliant technology, and its political environment. This immensely popular autobiography has been translated into over thirteen languages, and many copies have been sold worldwide. Dr. A. P. J. Abdul Kalam, the 11th President of India, is a scientist, author and administrator. He has also authored India 2020: A Vision for the New Millennium, Mission India, Envisioning an Empowered Nation, Indomitable Spirit, and My Journey: Transforming Dreams into Actions. Born in 1931, in Tamil Nadu, he procured a degree in aerospace engineering from MIT, Chennai. Before being appointed as the President, he had worked with the Defence Research and Development Organisation (DRDO) and the Indian Space Research Organisation (ISRO) as an aerospace engineer. This role won him the Padma Bhushan in 1981 and the Padma Vibhushan in 1990. He served as the President from 2002-2007. Arun Kumar Tiwari worked under Dr. Kalam on the Trishul and Akash missile projects. Tiwari is now a non-medical professional who dabbles in contemporary health care, and is currently employed as the Director of the Cardiovascular Technology Institute, Hyderabad.